Voutilainen’s highly regarded timepieces are synonymous with a certain style: guilloche dial, Breguet hands, and a case with teardrop lugs. But earlier this year the watchmaker tweaked the formula ever so slightly, introducing the 217QRS that features a newly designed case with more angular lugs that bring to mind teardrops with flattened sides. 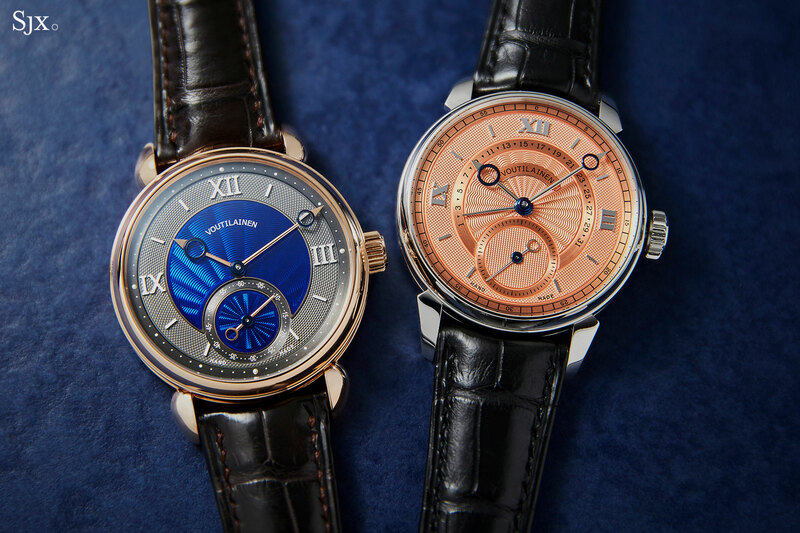 But Voutilainen also debuted a second new case style this year, albeit made in very small numbers for Singapore retailer The Hour Glass (THG). While the 217QRS ‘THG’ shares a familial resemblance to Voutilainen’s other watches, it is a completely new watch. 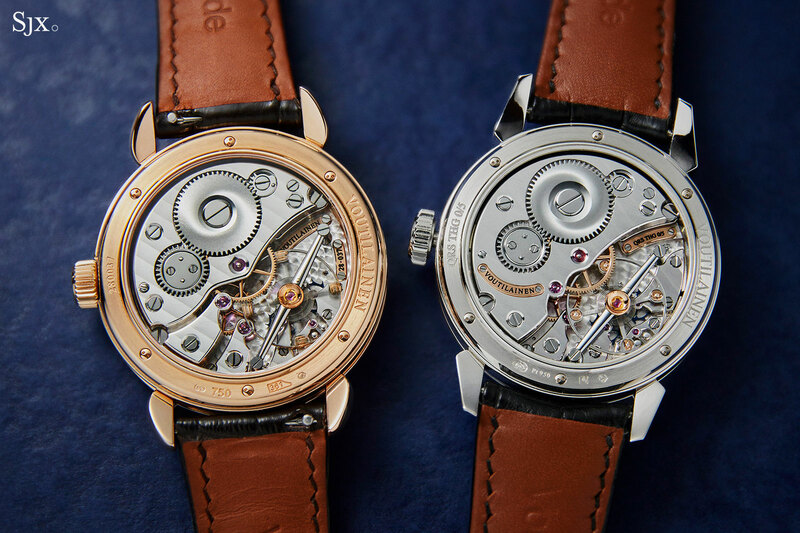 “The case shape is property of [THG] and case size is different; the lugs and dial design are different,” says Kari Voutilainen. To start with the platinum case is smaller than the standard Voutilainen case. It’s 38.5mm in diameter, compared to 39mm for nearly all Voutilainen watches, though the height remains the standard 11.5mm. The reduction in size is so slight that it’s not noticeable in itself, though the prominent lugs make the case feel smaller. 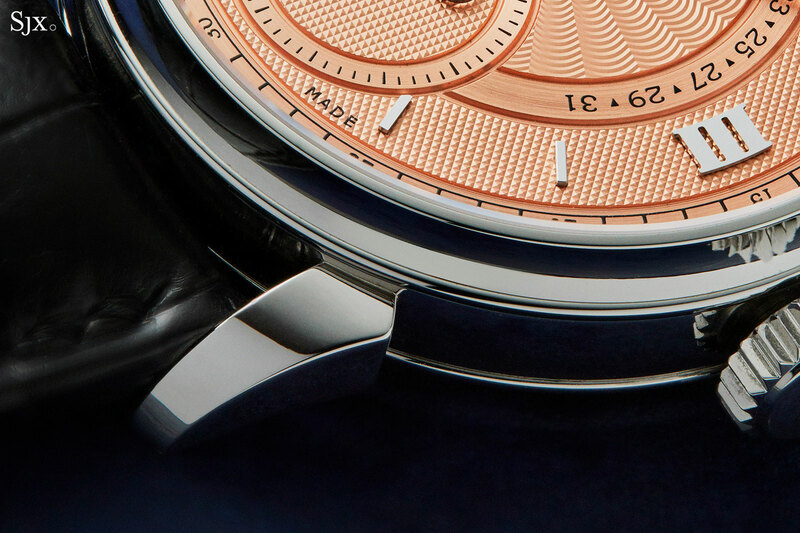 Flaring outwards from the case with a sharpish curve downwards, the lugs have a pronounced, sculpted form that’s more aggressive than the typical, rounded Voutilainen shape. 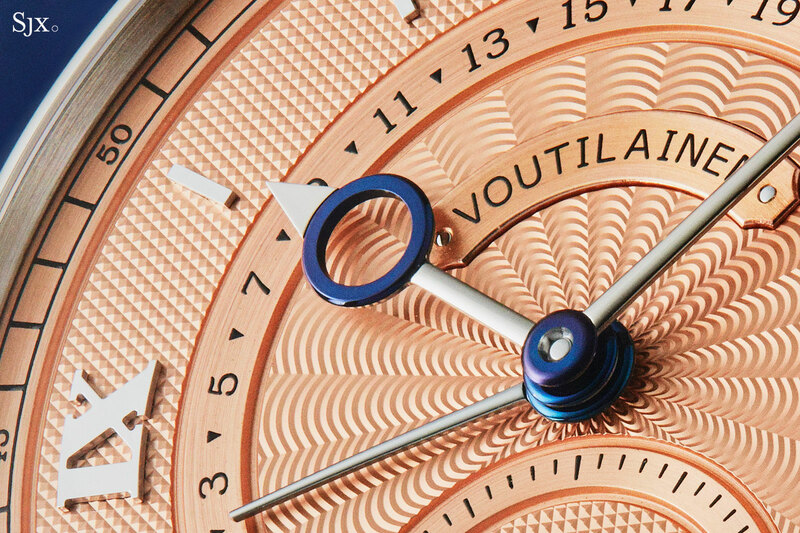 Voutilainen watch dials are typically solid silver, and then engine-turned and treated for colour. 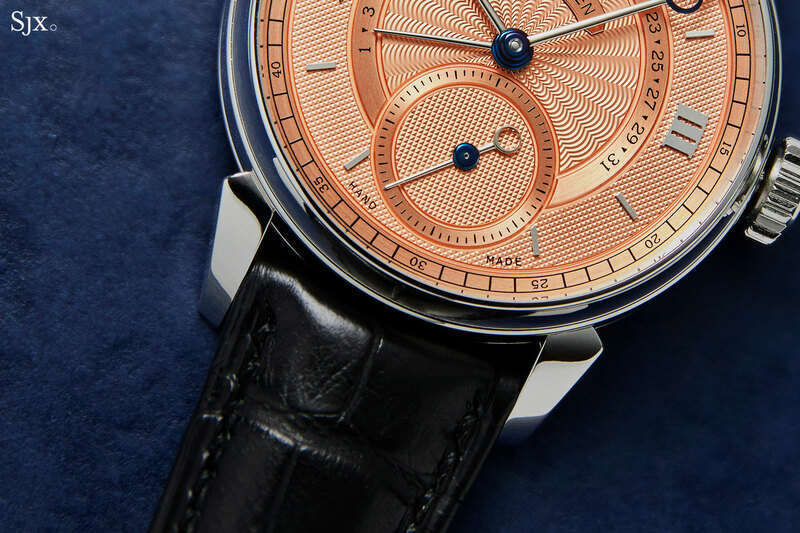 The 217QRS ‘THG’, on the other hand, has a solid gold dial base, which is then decorated with two types of guilloche and finished in a bright salmon colour. The dial design is also new, albeit in a subtle manner. 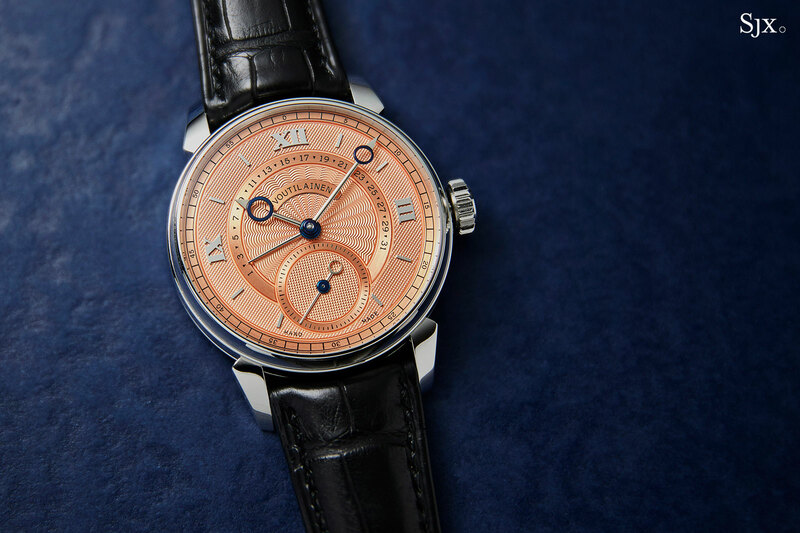 The Roman numerals for the quarters are modelled on those found on Voutilainen’s Observatoire – the Peseux 260-powered watch that made Mr Voutilainen a star – and have a typography distinct from that found on the brand’s existing watches. The serifs are finer while the numerals are weightier, altogether making them more visually appealing than the Voutilainen’s current typography. 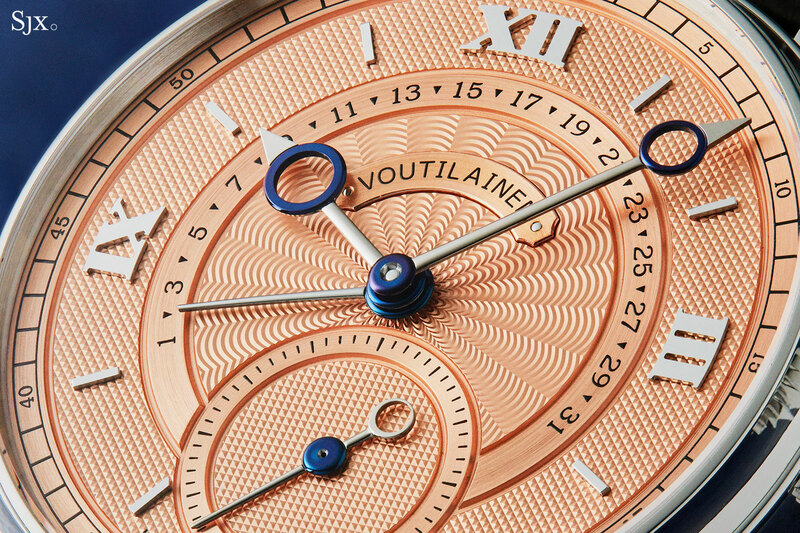 The hands are standard Voutilainen, made of steel but comprised of different parts, hence the two-colour finish. The blued portions are heat treated, while the rest is mirror polished with a natural finish. Mechanically the THG edition is identical to the standard model, powered by a movement that’s essentially the Vingt-8 calibre with the addition of a retrograde date. Two features, however, mark the date mechanism out as unusual. The first is its construction: the date is integrated into the base plate rather than being a module mounted on top. 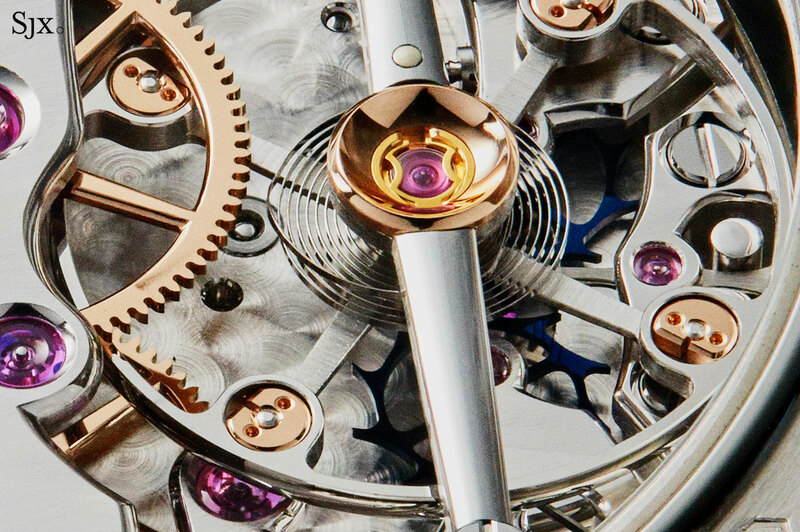 That allows the movement to be exactly the same height of 5.6mm as the standard, no-date calibre. The other notable feature is the slow-motion retrograde. While most retrograde date indicators jump from “31” to “1” in an swift, forceful motion, the date hand on the 217QRS embarks on a leisurely journey backwards, taking a few seconds to get there. Mr Voutilainen built the date in this manner to avoid the bouncing or inaccurate return (landing on “2” instead of “1”) that can happen with instantaneous retrograde mechanisms. Setting the date is easy: pressing the crown advances the date pointer by one day. 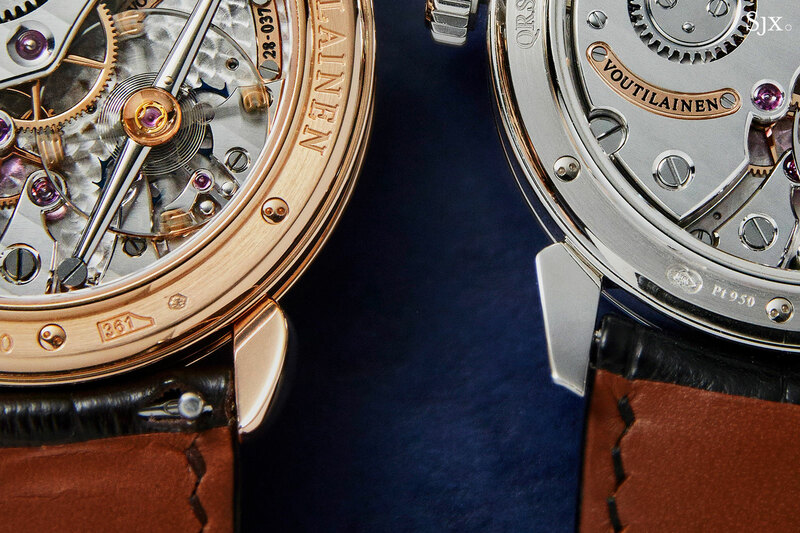 That convenience, however, is accompanied by visual giveaway – the crown sits slightly apart from the case, unlike on the standard Vingt-8 where it lies flush against the case band. 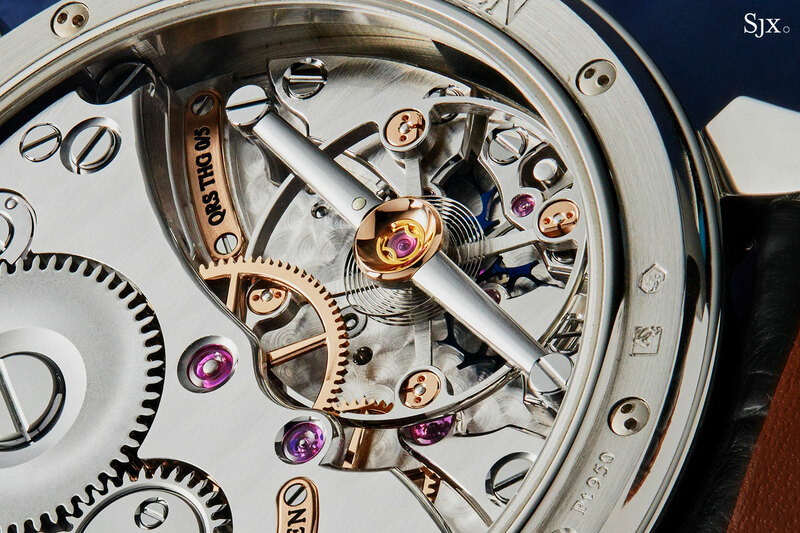 Like the standard Vingt-8, the movement of the 217QRS is hand-wound with a 60-hour power reserve. 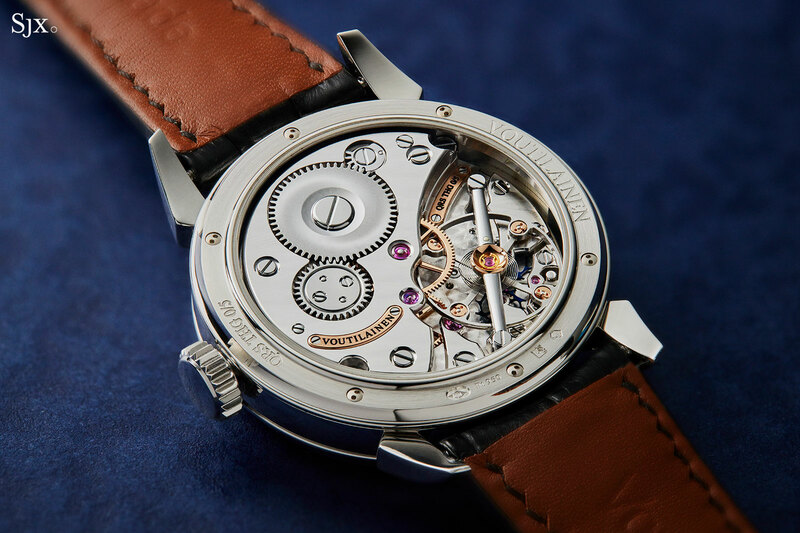 It’s distinguished by an oversized balance wheel – held up by a long, rounded and polished steel bridge – with adjustable weights, as well as a hairspring with both a Phillips overcoil and Grossmann curve. And it also has Voutilainen’s proprietary direct impulse, double wheel escapement that’s inspired by the Abraham-Louis Breguet’s natural escapement. 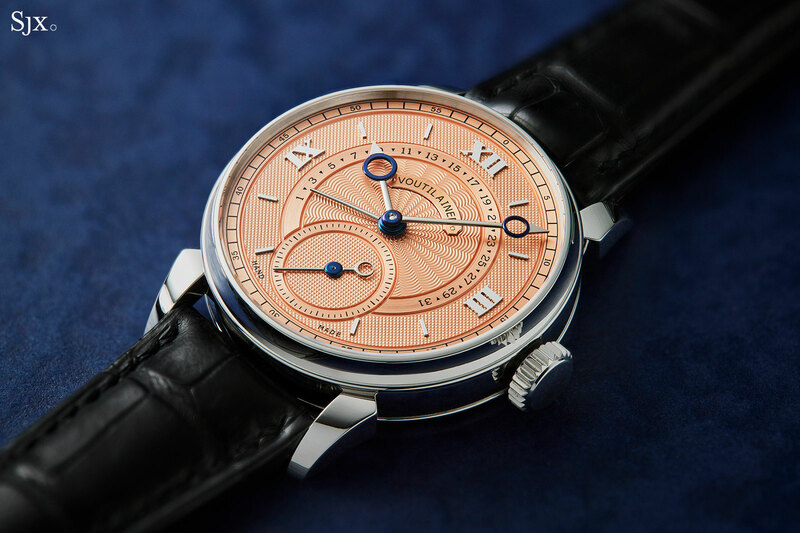 While the 217QRS movement is identical to the Vingt-8, minor cosmetic tweaks have been done, some of which are also found in other Voutilainen calibres. For instance the barrel and wheel train bridge is one piece, making it a two-third plate, and the company logo is engraved on a gold plate screwed onto the bridge. And the 217QRS movement also has larger escape wheel bridges. 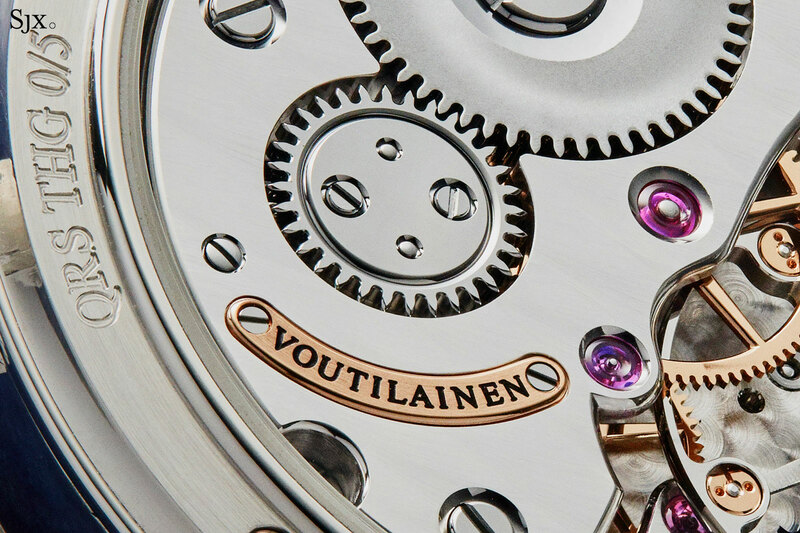 While the styling varies across Voutilainen movements, the finishing is always exemplary. 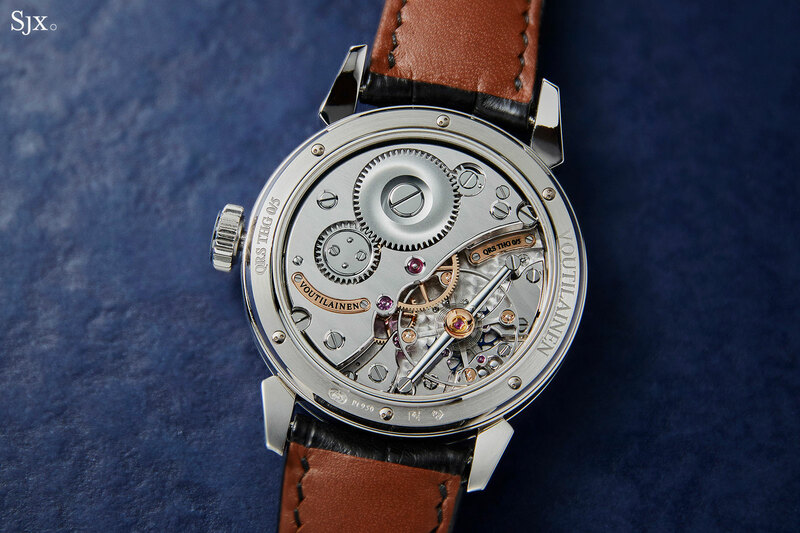 While Voutilainen often experiments with various coloured plating for its movements, the 217QRS is finished a traditional manner, with rhodium-plated German silver bridges finished with Cotes de Geneve, and a base plate finished with perlage. The 217QRS is a limited edition of five watches in platinum, numbered from “0/5” to “5/5”. There is no “4/5” as the number four is phonetically similar to death in Mandarin Chinese and various Chinese dialects. Price-wise the 217QRS ‘THG’ costs only marginally more (or just over 3%) than the standard version. By that benchmark it is fairly priced, though the 217QRS is pricey to begin with, priced at about US$35,000 more than a Vingt-8 in the same case material. That’s a lot for a date mechanism, even one as sophisticated and refined as this one. The 217QRS ‘THG’ is priced at S$183,500 including 7% sales tax, which is equivalent to US$133,000. It’s available only from The Hour Glass.